Drawing from a report by Save the Children, Electronic Intifada’s Managing Editor Maureen Clare Murphy, describes what she correctly terms, Israel’s managed “humanitarian crisis in Gaza”. A humanitarian crisis that is managed? Wait a minute; “managing” means controlling what happens. Yes it does. Which is how it comes about that Israel is managing “Gaza’s humanitarian crisis”. Aided and abetted by the United States, Israel has for five years deliberately and systematically blockaded Gaza with militarily-enforced “restrictions placed on the movement of people and goods in and out of Gaza”. The humanitarian crisis in Gaza does not come from floods, hurricanes, or earthquakes. This on-going crisis comes from the official policy of Israel. How could it be that American tax payers permit a blockade that “has been the single greatest contributor to endemic and long-lasting household poverty in Gaza”, an act that prevents families from access to food, medicine and medical care? Americans permit and pay for this “managed cruelty”, as the Electronic Intifada’s Maureen Clare Murphy, correctly terms Israel’s blockade policy. We are all “good Germans”, no different from those Germans who denied the reality of trains loaded with Jews that traveled through their countryside, bound for German-managed camps where Jewish men, women and children were starved, experimented on, and killed with modern efficiency. Stunting, or long-term exposure to chronic malnutrition, remains high, found among 10% of children under five. Anaemia, usually caused by dietary iron deficiency, affects most children in Gaza (58.6% of schoolchildren, 68.1% of children 9-12 months) and one-third (36.8%) of pregnant women. If untreated, iron-deficiency anaemia adversely affects child development and pregnancy outcome. Sanitation-related diseases with serious implications for child mortality, such as typhoid fever and watery diarrhoea in children under three years of age, have increased at clinics serving refugees in the Gaza Strip. Gaza’s polluted water supply will have long-term health implications, but current monitoring is insufficient to measure the impact of untreated sewage and poor water quality. The full Save the Children report, with footnotes, written in the unemotional tone of an official report, may be accessed at this link. It is an appalling situation for which Israel, the United States, and the rest of the “good Germans” in the world, are deeply liable and responsible. What do we do about it? Nothing. When protesters attempt to “run the blockade”, Israel kills its passengers. When Rachel Corrie stands in front of a Caterpillar tractor and demands that it not destroy a home in Gaza, Israel kills her. The American mainstream media ignores this blockade, accepting Israel’s pretense that the blockade is for security. The US Congress takes funds from Israeli backers and underlines its approval of the long-term exposure of Gaza children to chronic malnutrition, by cheering Israeli leaders who come to Washington asking for more money to starve children. Presidential candidates quake in fear that they will appear to be anything less than Israel lovers. Gaza’s only fresh water source is now too dangerous to drink and is contaminated with fertiliser and human waste, according to a shocking new report from Save the Children and Medical Aid for Palestinians (MAP). On the fifth anniversary of the blockade, Gaza’s Children: Falling Behind, reveals desperate families are being forced to buy from private sources, not knowing that in most cases this water too is contaminated, often at ten times the safe level. With 1.7 million people – including more than 800,000 children – crammed into just 365 square kilometers – an area roughly equivalent to the size of the Isle of Wight – Save the Children is concerned about the increasing threat of disease. “Innocent children are living in inhumane conditions after five years under a blockade. They are now forced to drink dirty and dangerous water that will make them weak and sick. Diarrhoea which is easily treated here in the UK can be a killer in these conditions.” said Justin Forsyth, Chief Executive of Save the Children. In this summer of 2012 while we look the other way, the children of Gaza live under an Israeli-managed program which systematically assaults children. This is official conduct that is illegal under any set of humane laws. It is also immoral under all known religious standards. There are only two crossings available for people to leave Gaza and people require select security permits to leave the heavily guarded exit. Crucial equipment needed to repair the sewage and water system remains blocked and on the restricted list of goods allowed in. Just one fifth of the equipment needed has been delivered to date, with the remainder sitting unused in warehouses. Israel must lift the blockade in its entirety to enable the free movement of people and goods in and out of Gaza, including the West Bank and Jerusalem. All planned water and sanitation projects must be implemented immediately and a clear timetable provided by the Israelis for their completion. The International Community, along with relevant authorities must implement long term strategies to improve conditions for children. The Palestinian Authority must facilitate the impartial and rapid material provision and funding of medical supplies and services in Gaza. Donor must ensure that funding is available for long term projects and not just emergency, short term projects. Nothing complicated there. Nothing that has not been said in more elevated terms in Matthew 25, where some harsh things are said about those who deliberately create a humanitarian crisis and then professionally manage the crisis to keep it going. At least that is what I see when I read about sheep and goats in my translation of Matthew 25. 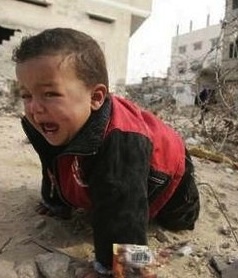 The picture above is that of a child in Gaza. It is from The Guardian. The report cited is from Save the Children, based in England. This entry was posted in Middle East Politics, Politics and Elections, Religion and politics, The Human Condition and tagged american tax payers, chronic malnutrition, electronic intifada, Middle East, politics. Bookmark the permalink. Now, those are the words of a madman, and the policy has been faithfully carried out in the Gaza prison for these ensuing 6-years plus (with the 2008-9 massacre a particularly vile eruption of the psychosis). The eyes of the world are averted, in shame and complicity. Christians, especially: HYPOCRITES! Thanks for trying, Jim. This is a painful, frustrating read. Pity the children and all of the prisoners of Gaza. I took note of the correctly focused outrage that continues to emanate from the halls of Congress and the American public concerning the Syrian regime’s slaughter of innocent civilians, including over 1,200 children. Yet, where was this outrage when Israel killed over 380 children during Operation Cast Lead at a far faster pace than Assad and his thugs? The answer lies in the same strain of self-delusion, hypocrisy and exceptionalism that defines the Palestinian tragedy. When Israel maintains a siege over the air, land and water boundaries of Gaza they are said to have vacated the settlements and the pundits ask, now why can’t Gaza flourish now that the settlers are gone? When Israel arrests, detains, abuses (see DCI report) and kills children (see Cast Lead), it is fighting terror. And what innovative solution does Congress come up with, for the US to cut funding for UNRWA. If this is not 21st century APARTHEID; then what is?? How, how, long is our nation, our government, going to ignore these obscenities to continue and close our eyes and ears and minds to what is going on?!!!!!! Very Interesting, Indeed !! To: C.Jones comment on June 19, 2012. The US Government is and will ignore the obscenities, (great term) and close our eyes, ears and minds as long as AIPAC can continue to buy influence, (Congressional members who serve as spokespersons and panderers) in our representative government. The money is what our representatives and Senators listen to, and forget the job they were sent there to do ! !